This turned out to exercise some of my graphics skills. For example, the dropdown list of "canned" examples is one of my favorite toys, the Owner Draw Combo Box. However, getting it to work right involved some graphics tricks. The itemData of each element is a VertexData value, loaded by enumerating all the VERTEX resources during OnInitDialog. In the DrawItem handler of the CComboBox-derived class, I wanted to scale the image to fit entirely in the small space of the selection area. I did not want to actually expand the combo box items to be as large as the images, but in effect show a "thumbnail". I was initially dismayed when I saw that the images were not being displayed properly; only the first image appeared, but none of the others did. Their apparent area was just plain white. Then I realized that the reason is that GradientFill would start the images at the nominal 0,0 point, and I wanted to draw them in the desired area. The trick was therefore to simply adjust the viewport origin to the rectangle being displayed. ñ I replace the horrible name lpDrawItemStruct with something that makes sense to type frequently. ñWith an owner-draw control, you must always be sure the state of the DC when you return is the same state you received it in. Rather than save tons of state in obscure variables (and possibly forget to restore one of them) I simply use SaveDC to push a new DC context, which I will modify. Note that I do not save any intermediate state in variables at all! ñDue to what is most politely called a design blunder, most Windows controls use the CS_PARENTDC style, so the clipping region of the control is actually the clipping region of the parent. This has never made sense, and in Vista this horrible mistake was finally corrected. But for earlier versions of Windows, we have to make sure we don't overwrite the parent, and the easiest way to do this is to create a clipping region. This also keeps any drawing from "spilling into" adjacent areas of the dropdown list when it is drawn. ñThe clipping region is selected into the DC. Note that I have carefully arranged the code so that the clipping region will be deselected before the CRgn::~CRgn destructor is called, so at the time it is called the region is not actually selected into a DC. This is important because otherwise the graphics space will be lost, because the destructor (specifically ::DeleteObject) will not actually delete an obect which is actively selected into a DC. ñBecause I will need to fit the image in, I need to know how big it actually is. The VertexData::GetBoundingBox method returns me a CRect which contains this information. ñSince I want the gradient fill to fill the ComboBox area no matter how wide or high the actual image might be, I use MM_ANISOTROPIC mapping so I can compress or stretch width and height by independent amounts. ñI set the "Viewport Extent" to be the actual size of the rectangle we are given. 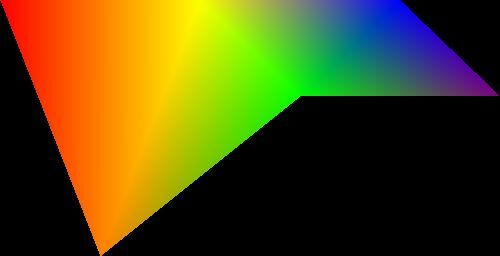 In MM_ANISOTROPIC mode, this means that the image will be compressed or stretched by the ratio of the two extents so that it is scaled appropriately for the area in question. ñBecause the gradient list has a nominal <0,0> origin, I have to offset the actual drawing by the position of the area into which it is being drawn. Then GradientFill will end up drawing the image in the area of the dropdown where I expect to see it. ñFinally, I do the GradientFill, using the parameters I got from the VertexData::FromBinary call. ñI am now done using the data I got from VertexData::FromBinary, so I call VertexData::Release to indicate that I am no longer using any pointers in the object. ñI need to draw a selection rectangle. I discovered that the ordinary focus rectangle was hard to see because of the complex graphics, so I wanted a much more emphatic rectangle, so I drew one explicitly. ñBecause I am about to do additional changes, I save the DC state. Note that I want to draw this rectangle using the default coordinates of the rectangle (MM_TEXT mode), so I do this after I have restored the DC from its mapping mode and origin changes. ñI use a dotted pen. Implicit here is the fact that the DC is in its default SetBkMode(OPAQUE) mode, so the areas between the lines of the pen are filled with the default background color, which is the default SetBkColor(::GetSysColor(COLOR_WINDOW)), or nominally white. So the black pixels of the pen will show up on light colors of graphics, and the white color of the background will show up on dark colors of graphics. ñSelect the pen into the DC. As with the region, I have carefully arranged that the DC will be restored before the destructor CPen::~CPen is called, so the pen will actually be deleted. ñSince I do not want to overdraw the actual graphics data I just created, I select a HOLLOW_BRUSH so the center of the rectangle I am about to draw will be transparent. ñActually draw the highlighting rectangle. I was using an owner-draw ListBox originally for the vertex list (because I wanted to show the color), and for the GRADIENT_RECT and GRADIENT_TRIANGLE arrays (because I wanted to be able to directly edit the contents without having to delete-and-re-insert the string, which is the only way to handle this when the normal ListBox is used). However, I found a few cases where I wanted to temporarily remove a rectangle or triangle to see the effect. Deleting and re-inserting was painful, so I decided to add a check-box ListBox, the CCheckListBox class. Add an interface that said "Highlight this point"
This whole effort was greatly simplified because clicking on a ListBox item sends a LBN_SELCHANGE notification even if the selection hasn't changed!. Otherwise, I would have had to use some sort of mouse-down detection in the subclassed ListBox class. This is very simple code. It merely computes a "highlighting rectangle" and invalidates it, then sets a timer. This code only executes if the preceding GradientFill operation returned TRUE, the value in the variable result. I used the presence of anything in the BoundingBox rectangle to indicate that a highlight should be drawn. The R2_NOTXORPEN means that the pixels will be modified not by just drawing the lines, but by complementing the bits of the pixels under the pen. This means the pen will stand out on either light or dark backgrounds. Since I no longer care about the timer at this point, I kill it. This screen shot shows what happens when I click the first element of the center-fill gradient, which has as its points 0, 1, 4. These represent the top left corner (0), the top middle (1), and the center (4) given the numbering I had assigned in the example. If you need to be able to change values in a CListBox without having to remove and re-insert the item, an owner-draw ListBox is a good choice. This is because there is no actual string to update (this means you can't use the LBS_HASSTRINGS style). Therefore, you can simply change the structure you are working on. All that is required is to force the ListBox to actually redraw the updated information. This is very easy. In addition, this makes actions such as "move item down" and "move item up" very straightforward. To move an item "up", you pick up its itemData and swap it with the itemData of its predecessor. 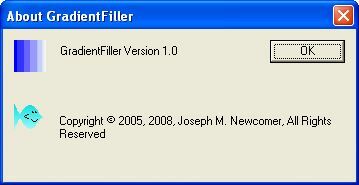 To move an item "down", you swap its itemData with its successor. OK, there's nothing worse than being trapped in a hotel room for a couple days (see the Notes section) to bring out the worst excesses in a programmer. I wanted the About box to at least show some use of GradientFill. Alas, the icon is limited to the standard 256-color palette, which is quite horrible. But I could create a gradient bitmap for the Flounder image. But it wasn't as straightforward as I thought. The problem was the background color: you can't have transparent bitmaps or use LR_LOADMAP3DCOLORS or LR_LOADTRANSPARENTon 24-bit bitmaps. So I just created a Flounder-colored gradient, and edited away anything that didn't look like a Flounder. I used the same basic convention that the top left pixel (the 0,0) coordinate) was the "transparent" color. Then I just modified the bitmap to replace that color with ::GetSysColor(COLOR_3DFACE). It was only in retrospect that I realized that I could have used the standard icon and just replaced all the Flounder-colored pixels in the original bitmap with the corresponding gradient pixels in the gradient image. Then I could have simply used a solid gradient image with no editing at all. I also set the background to black. Currently, I do not have an interface that allows changing this setting. Producing the complete bitmap involves creating a memory DC, selecting an appropriate-sized bitmap into it, and drawing into the DC. This is typically handled by the OnDraw member of the derived CView class. But this is a dialog-based app with no view. Other than having to explicitly implement the calls, however, the logic is essentially the same as the MFC document/view framework. The common drawing logic is a subroutine shared by both the OnPaint and ToClipboard methods. Save the state of the DC. This is necessary so the DC can be restored before the destructor of the region is called. Because the image is larger than the window, it is necessary to clip the drawing to the window area. This is the result of what can most politely be called a design blunder in Windows; controls have the CS_PARENTDC style, which means that the clipping region of the control is actually the clipping region of the parent window. It is hard to figure why this could have ever been construed to make sense, but it is an unfortunate fact of Windows programming (this blunder was fixed in Vista). The clipping region is selected into the DC. The region must be deselected before CRgn::~CRgn is called. Set the window origin so the image is scrolled to the right place, as selected by the scrollbars, which set the CPoint org to the correct offset values. The CRgn::~CRgn destructor is called, but because the HRGN is not selected into a DC, the region is actually deleted. The ::DeleteObject method will not actually delete a GDI object that is actively selected into a DC.